Republican state Sen. Leah Vukmir, left, meets with voters at the 2018 Waukesha County Fair. 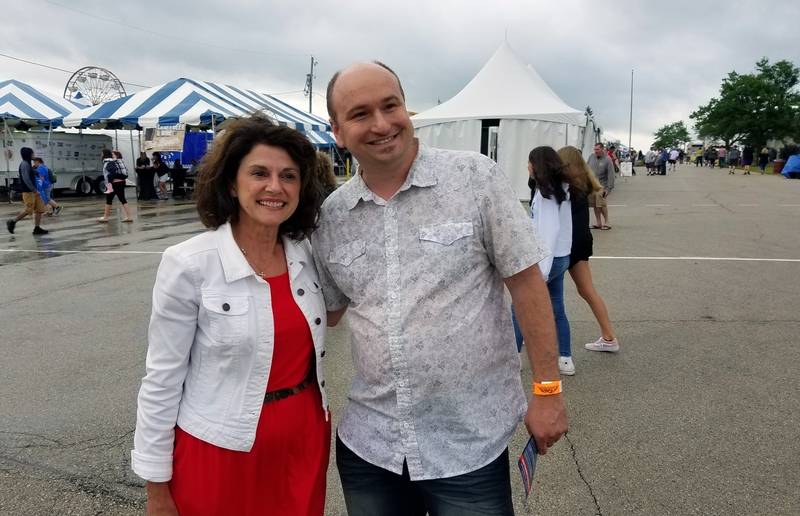 It can be tough to get voters' attention in the middle of summer, but at the Waukesha County Fair, people recognize Republican U.S. Senate candidate Leah Vukmir. Vukmir, a state senator from Brookfield, has roots here. She was first elected to the state Assembly in 2002 and to the state Senate in 2010. Her legislative record includes voting for Gov. Scott Walker's Act 10 collective bargaining law, Wisconsin's voter ID law, and a 20-week abortion ban. But part of the reason that fairgoer Liam Moran knew so much about Vukmir's campaign when he stopped by to shake hands is that he has heard her frequently on conservative talk radio. "I am definitely voting for you," Moran told Vukmir. "I am a conservative. Listen to you all the time on Belling and Weber and everyone else." The names Moran references — WISN Radio's Mark Belling and Jay Weber — are two of southeast Wisconsin's most prominent conservative hosts. They talk frequently with Wisconsin's elected Republicans, reinforcing and sometimes shaping the GOP message. Vukmir's connection to talk radio actually predates her time in the Legislature. When her daughter started kindergarten in the 1990s, Vukmir didn't like what her school was teaching, so she started a parent group to try to change the school's methods. Talk radio helped her spread the word. "In order to go viral in the early '90s before Al Gore invented the internet, we had to do it the old-fashioned way," Vukmir said. "So, we went to town hall meetings, we went to school board meetings, we wrote letters to the editor and we got on talk radio." Charlie Sykes, the radio host who gave Vukmir her start, said Vukmir stood out as an activist because she was so driven. "She really struck me as somebody who was very committed and really quite tireless," Sykes said. Vukmir's name recognition gave her a leg up when Walker, who was then a state representative, left the Legislature to run for Milwaukee County executive. She ran for his state Assembly seat and won. Sykes said he thinks it might have been a bit jarring for Vukmir when she first made the transition from activist to lawmaker. "She was not necessarily programed to be a team player within the Legislature, let's put it that way," Sykes said. "She knew what she wanted and she was willing to fight for it and she was not afraid to step on some toes." Vukmir's confrontational style would sometimes show itself during committee debates. At a 2014 hearing, public school teachers and administrators flooded a state Capitol hearing room to speak in favor of Common Core education standards. Vukmir, an opponent of Common Core, put them on the spot. "I just would love to see a show of hands," Vukmir said. "You're all educators. You ask your students to show hands. How many of you are here on personal time, not paid for by taxpayers?" Her question was met with a collective groan in the room. In 2009, when Democrats ran state government, they held a hearing on a bill that would let doctors prescribe medical marijuana. For advocates, this was an emotional moment, and people with terminal illnesses showed up to support the bill. Vukmir called the effort a "facade." "I think it's nothing more than a ruse for you to move toward full legalization of marijuana," Vukmir said. "I wish you would just come right out and admit that." This time, Vukmir's comment was met with boos. More recently, Vukmir held up a GOP bill to allow the sale of CBD oil, which is derived from the cannabis plant. She eventually supported it once restrictions were added. But despite her penchant for conflict, Vukmir is about as connected as they come in GOP circles. She's a former chair of the American Legislative Exchange Council, or ALEC, a national group that connects corporations with lawmakers to write legislation. Vukmir is endorsed by a long list of Wisconsin Republicans, including U.S. House Speaker Paul Ryan. She also has the formal backing of the state Republican Party, which has campaigned on her behalf. Walker hasn't endorsed in the Senate race, but he and Vukmir are friends. The governor's wife, Tonette Walker, has endorsed Vukmir. Their son, Alex Walker, works for Vukmir, and was one of the campaign staffers escorting her at the Waukesha County Fair. But despite her deep roots with the Republican Party, polls suggest Vukmir and GOP opponent Kevin Nicholson have their work cut out to reach undecided voters. In the latest poll from Marquette University, 30 percent of Republican primary voters were undecided in the Senate race. Marquette's poll showed Vukmir polling slightly ahead of Nicholson but within the margin of error. Other polls have shown Nicholson up. In an effort to gain an edge, both candidates have been making a play for President Donald Trump voters. "As I've traveled across the state, they like the fact that I'm a scrappy fighter," Vukmir said. "It reminds them a little bit of their president, who is rather scrappy." Vukmir said she's glad Trump is president, but he wasn't her first choice in 2016. Nicholson's campaign circulated a video Tuesday showing Vukmir, at an event hosted by Sykes in 2016, saying Trump "offends everyone." Sykes, who has since left talk radio and has made a name for himself nationally as a Trump critic, said he remembers Vukmir's comments well. "This is what makes her current campaign so disappointing and surprising," Sykes said. "Her current enthusiasm for him is jarring, although it reflects what’s happened to the GOP." Vukmir, who was an early supporter of Marco Rubio, cut a radio ad for Trump later in 2016. Her campaign noted that Nicholson had also supported Rubio, donating $250 to his campaign. Part of the reason disputes like these are receiving so much attention in the GOP primary campaign is that both candidates concede there's not much difference between them when it comes to the issues. That's also why this campaign has been so focused on the candidates' biographies. Nicholson is running as the "outsider," Vukmir as the "fighter." "People know me as a proven, consistent conservative," she said. "I'm feisty." Vukmir, the mom who worked her way up the ladder in GOP politics, said she has a history of pushing the envelope Wisconsin. Now, she said she wants to do the same thing in Washington.